A spacious one bedroom, south facing apartment on the first floor of this restored monastery, with the original building dating from the 12th Century. It is located within an hour's drive of Pisa, Florence, St Gimignano, Siena and Lucca or the Tuscan Coast. The apartment looks straight down the beautiful Val d'Era to the hilltop village of Peccioli. Castello di Alica is an excellent base for exploring northern & central Tuscany. The hamlet of Alica is just 2km from the village of Forcoli with it's cafe's and local shops. We have owned the apartment in Castello di Alica since 1995 and have been welcoming guests since 1997. We are extremely lucky to have found Norbert, who lives near the Castello and manages the apartment for us. We take care of all the bookings ourselves, and Norbert welcomes guests when they arrive and is the local contact in case of any emergency. Over the years this help has ranged from rental cars playing up (talking to the Italian equivalent of the RAC/AA) to guests losing a key. Clive works in the IT industry, and Linda runs a Garden Design business. We wanted a holiday home, and simply love Tuscany. We have since found that Tuscany changes with the seasons and is as beautiful in Spring or Autumn as it is in the Summer (when most people visit it). Location was important as we wanted to be able to easily get to Siena, Pisa & Florence and we wanted something with the "wow" factor. Castello di Alica fitted the bill. Hilltop Monastery with great views, superbly restored .... a real retreat from busy lives. The bathroom has an enclosed shower together with a sink, WC and bidet. The window looks west towards the olive groves. The living room has large windows looking out down the Val d'Era towards the hilltop town of Peccioli. Furnishings include 2 leather sofas, satellite TV and DVD. A range of maps and tour/local guides are provided to help you get the most from your visit. Traditional Tuscan-style kitchen has been handmade by a local company to complement the style of the Castello. Fitted with modern appliances including a dishwasher. The kitchen has windows looking out over the Castello courtyard down the valley. Golf Castelfalfi is 15 mins/15km away, and there are also 2 courses at Tirrenia. A set of clubs (Gents RH) are available to guests for their use. Outside: The exterior of Castello di Alica has been completely restored in line with Italy's rigorous historical building regulations using traditional methods and period materials including sandstone, exposed wooden beams and terracotta tile floors. The pool area is reached either via a walk around the perimeter walls, or through the courtyard and through the Villa building of the Castello. Cleaning / Towels / Linen / Maid service: Linen and apartment towels are provided. Cleaning and linen change is weekly. Really well presented apartment in a wonderful setting. Good pool. Owner is communicative, helpful and very organised. 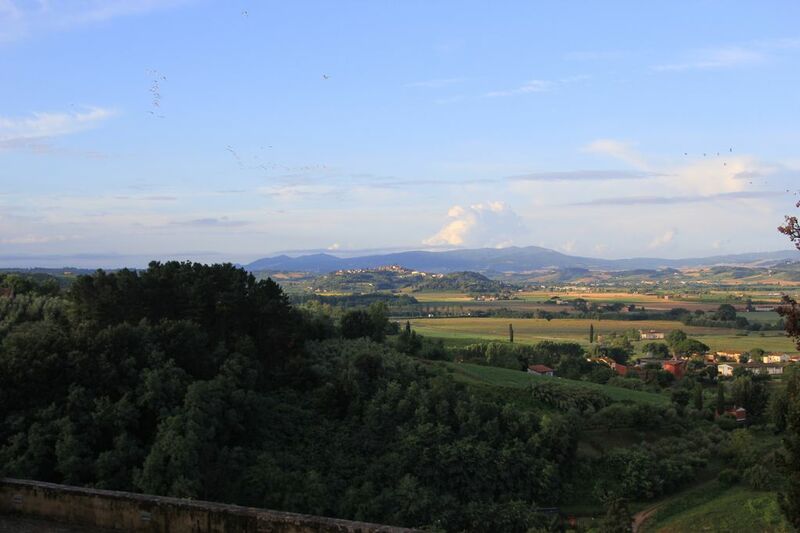 Handy location within stricking distance of Florence, Lucca, Siena, Voltera. Local property agent extremely friendly and approachable. Not for someone bothered about having all mod cons - no air con, electic kettle, toaster, no wifi - but decent 4G). We would definitely recommend for a peaceful break. We had a lovely holiday in Italy, it was our first trip and we found the people extremely friendly and welcoming. The apartment was very comfortable, and furnished to what we call 'English standard', the bed was the most comfortable we have ever slept in! Everything is there for a restful holiday. Unfortunately we did have to make use of the golfing umbrella on more than one occasion, but that was very handy to have. All in all we found Italy truly wonderful and are already looking to visit Florence for a long weekend. Tolle kleine Wohnung in ruhiger Lage. Das Kloster ist wunderschön. Es ist alles vorhanden was man benötigt. Die Wohnung und die Umgebung sind sauber und ruhig. Toller Urlaub. Der Kontakt zu den Vermietern ist freundlich und unkompliziert! Gerne wieder. The Tuscan Coast is 40 minutes drive away (Tirrenia or Castiglioncello). The Tuscan Riviera resorts starting at Viareggio are an hour away - but well worth the drive! The nearest airport is Pisa, which is only 35km away. Car Hire is highly recommended. The hamlet of Alica is just 2km from the village of Forcoli with it's cafe's and local shops. For exploring Tuscany, the major centres are all easily reached: Pisa (35km); St Gimignano (40km); Firenze (50km); Siena (60km); Lucca (35km). The nearest local shops can all be found in Forcoli (2km) - supermarket, banks, cafes, pizzeria, shoes/clothes. Booking Notes: To cater for the cheaper flights that are available from many European airports to Pisa, rentals starting on a weekday can be arranged. The minimum rental period during the mid and high seasons is 7 nights. Shorter stays are available at other times. A deposit of 50% is payable with the booking, the balance being due 6 weeks before arrival. Please contact the Owners by email or phone. Changeover Day: Changeover day is flexible to provide maximum flexibility to our guests. We would ask that you vacate by 12:00 unless previously agreed.